Monarch Air Group provides private air charter in Grand Canyon, AZ. Our clients benefit from top-notch service, unrelenting dedication to safety, wide selection of aircraft, and years of experience in chartering private jets. To obtain a free quote, please use our online quoting tool provided below, or call toll free 1-877-281-3051. Monarch Air Group offers private jet charter services to and from Grand Canyon, AZ, USA. The Grand Canyon is situated in northwestern Arizona near the southern border of Utah and the southeastern tip of Nevada. It was formed by the Colorado River over a six million year period and is about 440 km long, 8 to 24 km wide, and, in places, 1,800 m deep. Recognized as a natural wonder, the Grand Canyon is a home to the Grand Canyon National Park encompassing 277 miles of the Colorado River and neighbouring uplands. Being one of the world’s most popular vacation destinations it attracts more than 5 million visitors each year. The Grand Canyon offers variety activities from observation points on the North Rim of the Grand Canyon, backcountry trails and hiking trails, to scheduling a flight over this natural wonder in an airplane or helicopter or taking a river trip on the Colorado River. 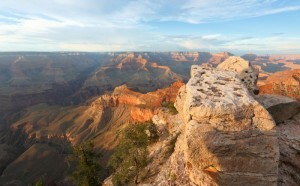 There is a five-hour drive of 215 miles between the park’s South Rim Village and the North Rim Village. The Grand Canyon’s South Rim is situated 60 miles north of Williams and 80 miles northwest of Flagstaff. The Grand Canyon’s North Rim is situated 30 miles south of Jacob Lake. The Grand Canyon is served by Grand Canyon Airport (GCN) and Flagstaff Pulliam Airport (FLG).